Since May is National Arthritis Awareness Month, I would like to take some time to focus this blog on osteoarthritis and the positive impact that physical and/or occupational therapy can have on this pathology. According to the Centers for Disease Control and Prevention (CDC) (2018), arthritis affects approximately 54 million Americans. Furthermore, the Cleveland Clinic (2018) estimates that over 16 million Americans are affected by the sub-type of osteoarthritis. Data from the CDC in 2013 revealed that arthritis care resulted in medical costs over $140 billion. There is a clear challenge with this condition, the associated impairments and functional limitations, and the impact on individual’s quality of life. However, there is also an opportunity for therapists and patients to work together and manage the condition and symptoms with conservative care, education, and self-management. Osteoarthritis is a sub-type of arthritis that involves the breakdown of articular cartilage (usually under load or repetitive stress). As this condition becomes chronic, it can lead to further cartilage damage, inflammation, and other musculoskeletal system damage (i.e. muscle, ligament, and bone). As this condition progresses, many factors build which usually results in pain and dysfunction. Yet pain and osteoarthritis do not necessarily go hand-in-hand. Yes, it is true that many patients with osteoarthritis experience pain, but it doesn’t mean that these patients need to suffer from pain. There is a wealth of research that shows that muscle strength is linked to pain and dysfunction in patients with osteoarthritis (meaning a loss in strength would result in an increase in pain and dysfunction). For therapists, there is also a wealth of research that shows the positive impact that strengthening and aerobic exercises can have on patients with osteoarthritis. A major component of the successful conservative management for osteoarthritis should focus on appropriate strengthening exercises for the involved musculature. Likely involved musculature would include: quadriceps and gluteal strengthening exercises for knee osteoarthritis, gluteal and hip flexor strengthening exercises for hip osteoarthritis, and scapular stabilizers and rotator cuff strengthening exercises for shoulder osteoarthritis. Along with appropriate strengthening exercises, complimentary interventions strategies may include aerobic exercise, manual therapy, kinesiology taping, and modalities. A study by Deasy et al. (2016) examined trends of hip muscle strength in patients with symptomatic knee osteoarthritis. The notable findings of the review and analysis showed the most correlation of loss of hip abduction strength with symptomatic knee osteoarthritis. The important hip abductors to focus on in therapy are the gluteus medius (glute med.) and gluteus minimus (glute min.). These two muscles provide lateral stability and stabilize the pelvis during single-leg stance and during the stance phase of gait. A study by Ganderton et al. (2017) provides a review of some of the common therapeutic exercises that have appropriate activation of these gluteal muscles. The authors concluded that a hip hitch or hip hike was an exercise that showed good activation of these muscles and would likely be tolerated in a symptomatic population. Other exercises that have been shown to be effective for gluteal activation may include step-ups, lateral step-ups, single-leg stance, “monster walks”, and variations of the clamshell. A commonly utilized intervention for osteoarthritis is manual therapy. Many therapists utilize manual therapy techniques to improve range of motion, however newer research shows that these techniques may also be valuable in reducing pain. A study by Courtney et al. (2016) examined the effects of joint mobilizations on pain modulation in patients with symptomatic knee osteoarthritis. In this study, mobilization techniques were utilized for 2 sets of 3 minute bouts. The results showed improvements in pain modulation following the application of joint mobilization manual therapy techniques. This is important for therapists to know, because it gives us the information to show that manual therapy can be used not just for loss of motion, but also to help reduce pain and symptoms. Another commonly utilized conservative intervention for osteoarthritis is kinesiology taping. 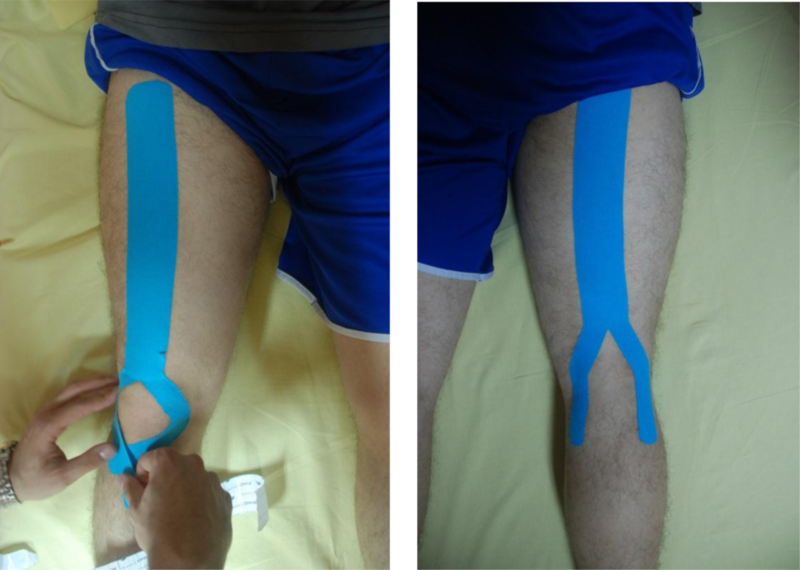 In general, research seems to support taping as more of a short-term benefit compared to long-term. However, just because something only provides a short-term benefit doesn’t mean it’s not beneficial for patients. A study by Aydogdu et al. (2017) examined the effects of kinesiology taping for the quadriceps muscle group in patients with knee osteoarthritis. The taping technique that was utilized is shown in the picture below. Results showed that the patients that received kinesiology taping had a reduction in pain and overall improvement in functional status following the intervention. Now, don’t get me wrong, I do not think that kinesiology taping is the end all be all of treatments, but I do think it can serve a purpose in a multi-modal intervention plan of care (and there is some research to support that!). So as I realize this blog is getting longer and longer, I hope you have found a good benefit in reading it. For people with arthritis that have pain and/or symptoms: You are not alone! Motion is lotion! Make sure to stay moving, adopt some light exercises to start and then progress as it is comfortable. A light walking program that starts to progress toward 30 minutes (total accumulation) per day for about 5 days per week can be a great addition to the conservative management. For therapists: Don’t scare your patients towards pain. Show these patients compassion and empathy. Remember to balance your treatments, but good strengthening exercises are probably the best to work toward. Use manual therapy, taping, and modalities to help make other things more comfortable in the short-term. If you are not familiar with some of these interventions, look to build your treatment toolbox by taking continuing education courses. I love when I learn new techniques that work quickly with my patients. It not only makes my treatments easier, but my patients get better (as usually quicker!). Thanks for taking the time to read this blog post! Hope you enjoyed! To register or learn more about my course, “Evidence-Based Rehab Strategies for Joint Replacement,” click here! Aydogdu, O. et al. (2017). Clinical outcomes of kinesio taping applied in patients with knee osteoarthritis: A randomized controlled trial. Journal of Back and Musculoskeletal Rehabilization, 30: 1045-1051. Courtney, C.A. et al. (2016). Joint mobilization enhances mechanisms of conditioned pain modulation in individuals with osteoarthritis of the knee. JOSPT, 46(3): 168-176. Deasy, M. et al. (2016). Hip strength deficits in people with symptomatic knee osteoarthritis: a systematic review with meta-analysis. JOSPT, 46(8): 629-639. Ganderton, C. et al. (2017). Gluteus minimus and gluteus medius muscle activity during common rehabilitation exercises in healthy postmenopausal women. JOSPT, 47(12): 914-922. Jamtvedt, G. et al. (2008). Physical therapy interventions for patients with osteoarthritis of the knee: an overview of systematic reviews. Phys Ther, 88(1): 1-14. Zhang, W. et al. (2010). OARSI recommendations for the management of hip and knee osteoarthritis part II: changes in evidence following systematic cumulative update of research published through January 2009. Osteoarthritis and Cartilage, 18: 476-499.